Motion sickness occurs when people feel dizzy or nauseated because the motion their body senses and the motion their eyes perceive are not synchronized. The conflicting messages sent to the brain make them feel ill.
Jon and his dad were very excited about their upcoming deep sea-fishing trip off the Florida coast. Dad's friend Bob had a boat and knew the right spots to look for fish. The sun was bright, and the sea was choppy that day. Bob traveled out about four miles from shore. Suddenly, his motor quit, and the boat vigorously bobbed up and down on the waves. First Jon felt queasy in his stomach, and then he broke out in a cold sweat. He became nauseated and vomited over the side of the boat. When they got back to shore, Jon's queasiness went away fairly rapidly. He felt frustrated that the pleasure of the fishing trip had been ruined by his bout of motion sickness. Dizziness, vertigo * , and motion sickness are all related to the sense of balance and equilibrium in the inner ear. Researchers in space and aero-nautical medicine call this sense spatial orientation, because it tells the brain where the body is in space. * vertigo (VER-ti-go) is the feeling that either the environment or one's own body is revolving or spinning, even though they are not. 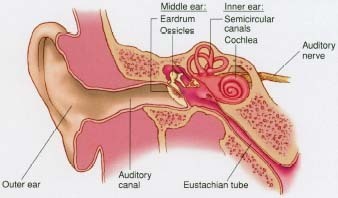 The chamber of the inner ear known as the vestibular labyrinth (ves-TIB-u-lar LAB-e-rinth) consists of fluid-filled, interconnected tubes called semicircular canals that monitor the direction of motion. Antony of the inner and middle ear. The eyes send signals to the brain about where the body is in space. Skin pressure receptors tell the brain what part of the body is touching the ground. Muscle and joint receptors tell the brain what parts of the body are moving. The brain processes all the information from these sensors and puts everything together. When information from the sensors appears to conflict, the brain is confused, and in many people motion sickness occurs. When the boat Jon was in was tossed about on the waves, information from Jon's eyes did not match the information about the boat's movement coming from other parts of his body. This caused him to feel uncomfortable and to vomit. The sensitivity to mixed sensory messages about movement seems to be inherited; motion sickness tends to run in families. Almost everyone can get motion sickness at one time or another. Some people, especially children, become queasy when riding in a car or an airplane. Other people get seasick from the rocking motion of a boat on rough water. Some people feel sick from riding a roller coaster or a spinning carnival ride, or even watching a jumpy, fast-moving scene in a movie. Poor ventilation, odors such as gas fumes or smoke, and drinking alcohol make a person more susceptible to motion sickness. Preventing motion sickness is easier than treating it once it has begun. Travelers should sit wherever there is the least motion. In a car, sitting in the front seat and looking straight ahead may help. In an air-plane, passengers feel the least motion in a seat over the wing. On a ship, remaining on the deck and looking at the far horizon rather than nearby objects may help. Eating only a light meal before traveling and avoiding alcohol also help a person avoid motion sickness. One of the most effective methods of preventing motion sickness is known as "the patch." The patch is a small spot bandage that is usually worn behind the ear. The patch slowly releases scopolamine (sko-PALL-a-meen) through the skin. Scopolamine works by suppressing certain areas of the central nervous system, which decreases motion-induced nausea and vomiting. The patch provides lasting protection against motion sickness for about 3 days. The most common side effect of the patch is dryness of the mouth. Other less common side effects include drowsiness and dilation (widening) of the pupils of the eyes. Over-the-counter medications such as meclizine or dimenhydrinate (Dramamine) can be effective in preventing motion sickness. They work best if taken an hour or so before traveling. Although it is not a proven medical remedy, some people rely on ginger root, either sliced and chewed or brewed as tea, as a way to prevent motion sickness. In severe or prolonged cases of motion sickness, a doctor may prescribe a scopolamine patch. Once the symptoms of motion sickness start, they are difficult to treat while the upsetting motion continues. For most people, the symptoms stop soon after the motion stops. If the symptoms persist, the person should consult a physician, because another disorder may be causing the symptoms. American Academy of Otolaryngology—Head and Neck Surgery, One Prince Street, Alexandria, VA 22314-3357. This organization's website provides information about the inner ear and how it controls balance.